More than 50 plungers appeared along 22nd Street between Spruce and South streets on Thursday. Dozens of plungers may have made your commute to work Thursday morning a bit more interesting. The rubber devices more commonly seen in bathrooms than stuck on asphalt now line the bike lane along 22nd Street from South to Spruce streets, but the job wasn't the work of the Philadelphia Streets Department. The idea didn't come from the mind of the Bicycle Coalition of Greater Philadelphia or from your local handyman, either. Thank Safer Streets PHL – a month-old anonymous group made up of a handful of cyclists and urbanists from the region aiming to "make the streets safer for everyone" – for the late-night mission that was then documented on the group's Twitter, @SaferStreetsPHL. Members of the group, which is not affiliated with the city of Philadelphia, self-funded the plungers, glue and chalk, a member of Safer Streets PHL said when reached by email Thursday. 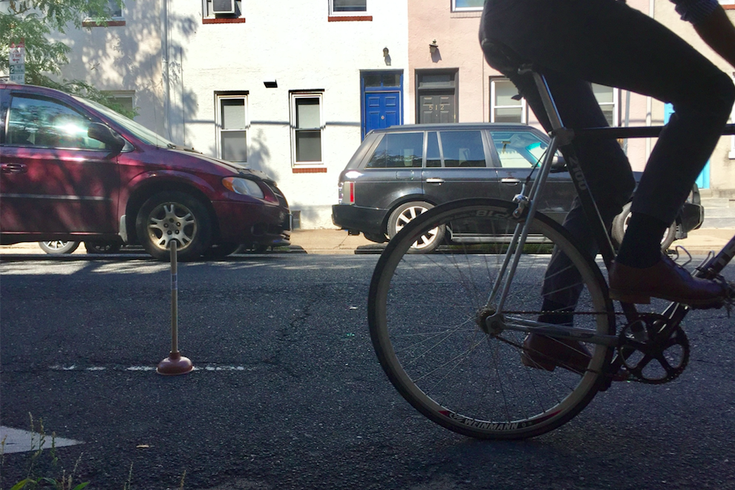 The plungers that line 22nd Street – they've mostly been knocked over by Thursday afternoon – are the first of what the group hopes will be many endeavors to increase awareness on making streets safer. Safer Streets PHL cornered 22nd Street as a problem area worth highlighting but said that future projects are "in the pipeline." "Despite being one of the most utilized bike lanes in the city, the paint has largely worn off it, and drivers treat it like another lane," the group said in an email to PhillyVoice. The group's not wrong. The Center City District published a report in October 2016 that noted an uptick in bike commuters and noted that 13th and 22nd streets were the only two with bike lanes and were also the most used, "accounting for 37 percent of all rush hour cyclists." The plungers created a faux protected bike lane, often nicknamed a sidewalk for cyclists. Many cities use planters, curbs or plastic dividers to create space between a light metal bicycle and 4,000-pound car sharing the same part of the road. Safer Streets PHL's swift act in the night is not unlike Dave Brindley, a West Philadelphia resident who collected stray traffic cones to create his own makeshift protected bike lane along a busy spot near 37th and Spruce streets in University City. The cones were left up for two years, Philly.com reported in December. Philadelphia is making some headway on its own real-life protected bike lanes. Last fall, the city unveiled its first two-way, mile-long protected bike lane in Mayfair, the first of 30 miles it plans to add in the coming years. Now, the city is working on adding its first one-way protected bike lane on Chestnut Street between 34th and 45th streets. "Our long-term goal is to make the roads safer for all road users," Safer Streets PHL said. "We’re doing this by drawing attention to existing infrastructure that needs repair and potential projects for PennDOT and the city."